With next Tuesday marking the official first day of summer—a season when many people spend more time outside than other times of year—today we‘re focusing on the study’s findings in relation to being outside and in an open lawn setting. 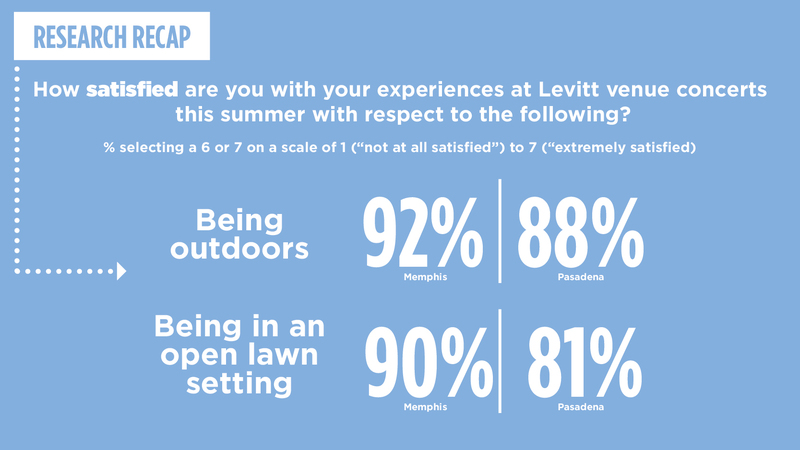 Based on hundreds of audience surveys and interviews in Memphis and Pasadena, each home to a permanent Levitt venue, a majority of people find being outdoors and in an open lawn setting “extremely satisfying” (see graph below). With open lawn settings, there’s a sense of “all are welcome” as there are no permanent seats and people are able to move around more freely. 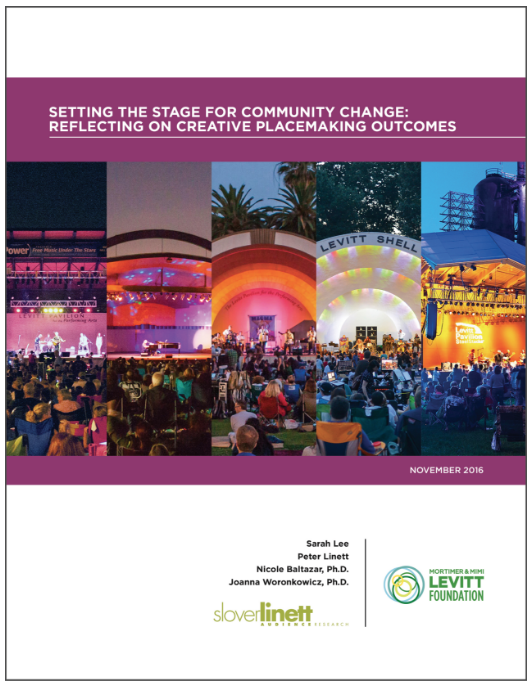 The white paper explains that the open lawn setting of Levitt concerts creates a “leveling” effect that makes concertgoers feel a sense of equality with their fellow audience members, and a sense that socioeconomic differences fade away while enjoying a Levitt concert. “Good seats” are available to anyone, not just those who can afford them, and everyone can sit where they like. The open atmosphere and sense of equality, in turn, inspire people to mingle with one another, both within their own social groups, and also across demographic boundaries—fostering what sociologists call social bridging. These kinds of interactions build social capital and help strengthen the social fabric of a community. The choose-your-seat approach also means that, excepting practical considerations like how close to the start time they arrive, concertgoers feel a sense of autonomy in choosing the experience that they want to have—whether to be close or far from the stage, whether to dance, toss a Frisbee, chat with friends or just sit and listen to the music. Given their positive associations, it’s no wonder the majority of surveyed concertgoers reported high satisfaction with being outside and in an open lawn setting. What was their reaction to other features of the Levitt experience? Stay tuned for more research takeaways in the coming weeks to find out!